We at Bare Feats Labs obsess over products that increase the speed of your Mac. However, as painful as it is to admit, speed isn't everything. Consumers have other needs. In the case of storage devices, sometimes capacity and security are a higher priority than speed. The EnhanceRAID E500FR is case in point. It comes with five 3.5" drive bays for drives which share one eSATA, one USB 3.0, and two FireWire 800 ports. Nothing unusual there but with the release of the 2012 Apple laptops with USB 3.0 ports, there is strong interest by those consumers in any storage device with USB 3.0 support. Plus, if you are jumping between different models of Mac, it helps to have port choices. A key feature is the user configurable Hardware RAID support giving you the flexibility to choose between JBOD (full capacity), RAID-0 (full performance), RAID-1 (full redundancy) and RAID-5 (perfect mix of RAID protection and performance). We tested RAID 0 and RAID 5 modes on both USB 3.0 and eSATA ports. We tested the E500FR using the Retina MacBook Pro's USB 3.0 port. And we used the built-in Thunderbolt port (with adapter) to connect to the eSATA port. As a bonus, we compare it to a Thunderbolt RAID enclosure for perspective. The Retina MacBook Pro is the test "mule." Its built-in Thunderbolt port was used for Thunderbolt connection, the Sonnet Echo Pro Thunderbolt-to-ExpressCard/34 adapter with Tempo EDGE SATA Pro 6Gb ExpressCard/34 for eSATA connection, built-in USB 3.0 port for USB 3.0 connection. HDDs used in the EnhanceRAID E500FR and Promise Pegasus R4 were 1TB Seagate Barracuda model ST1000DM003. As we said at the beginning, the EnhanceRAID E500FR is not the fastest storage option, but it offers two important qualities: capacity and reliability (RAID 5). The USB 3.0 port is a useful alternative to Thunderbolt in the case of the 2012 MacBook Pro and MacBook Air. The transfer speeds with the single shared USB 3.0 and eSATA ports are on par with Port Multiplied eSATA enclosures which typically top out at around 230MB/s no matter how many drives are attached to the shared single port. The only way to go faster is to have a dedicated port for each drive bay -- but then you lose "RAID-in-the-box" feature. The E500FR's Hardware RAID is managed with an app called HWRaidManager. It is easy to use for configuring your RAID set and monitoring its "health." We can't comment on the ability to rebuild the RAID 5 set since we didn't test that. The E500FR is compact for a 5 bay storage enclosure (10.25" by 5.75" by 7.75"), and the large cooling fan is very quiet. We can add flexibility as an adjective since the presence of three kinds of data ports make it possible to move the E500FR between various models and makes of Mac. FireWire 800 is old news so we omitted that on the graphs. FYI, it measured a paltry 26 MB/s READ and 53 MB/s WRITE connected to the Mac Pro FW800 port. It measured 25 MB/s READ and 55 MB/s WRITE connected to the ThunderBolt-to-FireWire 800 adapter on the RMBP. Those are low numbers for even Firewire 800 but I expect most buyers of this product will be using the USB 3.0 or eSATA port. 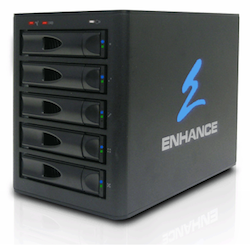 BOTTOM LINE: The EnhanceRAID E500FR offers Capacity, Flexibility, and Security for Macs with USB 3.0 and/or eSATA ports. CDW has it with pre-installed 1TB drives for $1339. Safe Harbor is selling the chassis only for $541.